After 30 years as a critically acclaimed singer and songwriter, Rosanne Cash shares her recollections growing up as Johnny Cash’s eldest daughter and coming into her own as a performer, daughter, and mother in a long-awaited memoir, entitled Composed (Viking), which will go on sale August 10th, 2010. The same day, Cash will embark on a multi-city book tour to read selections fromComposed, sign copies, and perform a few songs at select stops. Attendees will be treated to personal anecdotes from Cash’s extraordinary life that she tells in Composedwith the trademark intelligence, compassion, humor, and honesty that also informs her songwriting. Cash will make a number of media appearances in support of Composed. On August 10th, she will be interviewed on Good Morning America and perform a song from her first-ever covers album, The List, which was released in October 2009. A frequent guest on NPR, Cash will also be interviewed for “All Things Considered” in a segment airing the week of August 10th, and on WAMU’s “The Diane Rehm Show” on August 12th. She will also perform as a duo with her husband and guitarist John Leventhal at Southold High School in Southold, NY, on August 21st (after which she will sign copies of Composed), as well as with her band at the Minnesota State Fair on August 30th and the Hardly Strictly Bluegrass Festival at San Francisco’s Golden Gate Park on October 2nd. Over the course of her career, Cash has recorded fourteen albums, including 1981’s goldSeven Year Ache and 1987’s gold King’s Record Shop, and charted 21 Top 40 country singles, 11 of which climbed to No. 1. She has received ten Grammy Award nominations— winning in 1985 — and was nominated last December for “Sea of Heartbreak,” a duet with Bruce Springsteen on The List, which is eligible for Grammy consideration this year.The album, which Vanity Fair called “superb,” debuted in the Top 5 on the Country Chart, and entered the Billboard 200 at No. 22. The List has been nominated for “Album of the Year” by The Americana Music Association, which will announce the 2010 winners in a ceremony held September 9th at the Ryman Auditorium in Nashville. Cash will attend and perform at the event. Cash is also the author of Bodies of Water and the children’s book Penelope Jane: A Fairy’s Tale. Her essays and fiction have been published in The New York Times, Rolling Stone, and New York magazine. 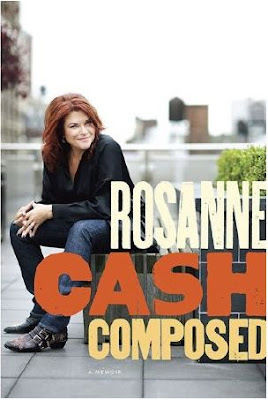 For more about Rosanne Cash, Composed, and The List, please visit www.rosannecash.com.